The quantities for this Vegetarian Christmas Pudding will make enough for six large helpings and will stretch to eight or more if required. If you decide to add nuts, make sure none of your guests have allergies. This recipe was donated by my mother. 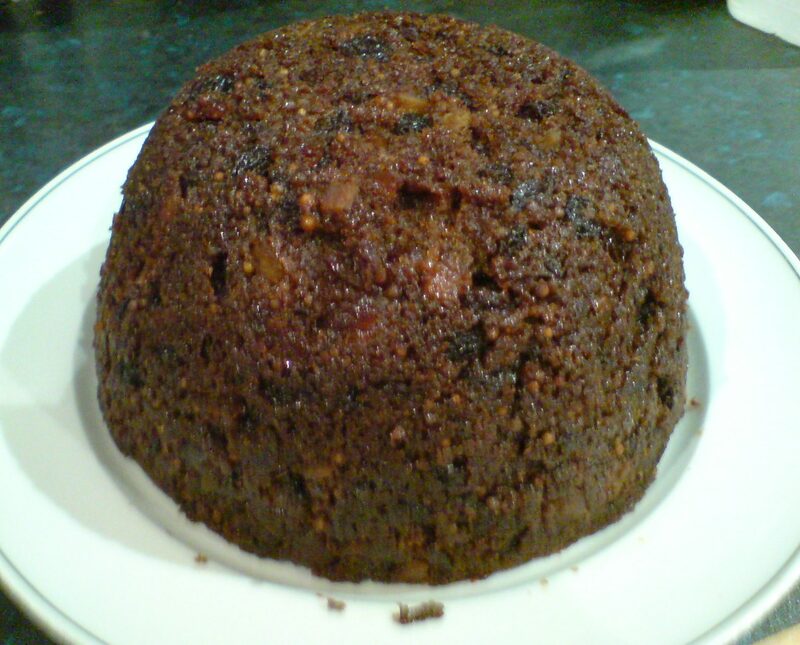 We enjoyed this pudding at Christmas 2001 during our visit to AUS, it suits the life style there as it is is much lighter than the traditional English recipes. Serve in the same way as you would a traditional christmas pudding, with brandy butter, cream or icecream. 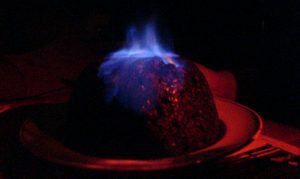 You can also flambe it in the traditional way with Brandy or another spirit of your choice. Glass or china bowl (about 2pints/1l capacity) and large pot for steaming. The fruit can be a mixture of practically anything, currants, raisins, sultanas, glace cherries, etc. A little candied peel adds a zing. You could try some dried apricots, dried prunes (do not use too many of these and cut them up to sultana size pieces) if you want to experiment but try the basic recipe first. You could also try adding some nuts (see the warning above) but again, not too many, perhaps 1oz of the total, cut these up small as well. Soak the Sago in the milk overnight. Optionally, soak the dired fruit in 3 tablespoons of cooking brandy overnight as well. Bring the butter just to the point of melting to aid mixing. Add all the ingredients and mix well together. Grease the inside of the bowl to be used for steaming well using a little more butter. This will help it release after cooking. When throroughly mixed put the mixture into the steaming bowl progressively, pressing down well as you go. Cover the bowl tightly with aluminium foil tied with string. Leave at least 1/2″ (1cm) above the pudding level to the top of the bowl for expansion. The aluminium foil should be creased to allow for expansion as well. You do this by making it much bigger than the top of the bowl, fold it in half, then fold a strip about 1/22 (1cm) wide back on itself at the crease. 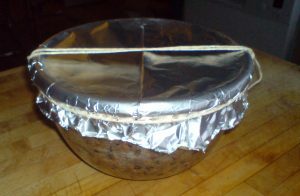 Open the foil back up but leave the centre strip folded. Get someone to hold the foil whilst it is tied. the objective is to keep all the moisture that is inside whilst keeping all the water that is outside out of the pudding. Put 2″ (5cm) of water into a large pot and put in the pudding in the bowl, spacing it at least 1″ (2cm) off the bottom. Bring the water to the boil and turn the heat down until the pudding is gently steaming. Steam for 3 hours, watching carefully that it does not dry out. A pressure cooker is ideal for this job but do not use any pressure, you could end up with a new pattern on the ceiling ! You can either serve straight away, serve it cold or reheat thoroughly and serve it hot later. This pudding will store well for many days if you want to make it in advance. Just make sure that it is not left uncovered and that it is kept in a cool place (less than 16 degrees). Enjoy with a sweet dessert wine and Merry Christmas to all! Thanks to Pat, my late mother for this treasure. This entry was posted in dessert, recipes and tagged christmas, cooking, dessert, food, pudding, recipe, vegetarian on December 24, 2016 by john.